Ask any expert in home remodeling, and you’ll hear the same feedback about upgrades: Buyers like kitchens and baths. This means, when you want to update your home to boost potential resale value, these are the best places to start. A glass shower door: When you want an upgrade that’s both stylish and practical, consider frameless glass shower doors. Not only does a glass shower door look modern and luxurious, but it also adds convenience. On a flat bathroom floor, for example, it makes access in and out easier, without any steps required. This means it can be a great choice for frail or aging individuals. Glass shower doors also extend the visual sight line farther into the bathroom, making it possible to show off custom tile work and/or add a more spacious feel to the room. Bench seating: A large shower is the perfect place to add a bench, creating a wonderful place to relax and enjoy a lengthy, luxurious scrub. While built-in seating is typically added during the building process, a simple teak shower seat or a new bench is doable any time. Shower shelving: Storage solutions are a welcome addition to any bathroom, especially with shelving in the shower. Shelves create places for housing soap, shampoo and other necessities, conveniently and within reach. Today’s market includes shower doors with glass shelves, shower inserts with built-in shelving and, always, the option to customize shelving for your space. Think about what you’d like best and what works with your budget to make a smart choice. A new showerhead: Believe it or not, the right showerhead can make all the difference in a luxury showering experience. You could go for a rain showerhead that mimics the feel of standing beneath a waterfall; or multiple showerheads that spray you from different angles, for example. When you install a new showerhead, you add fresh value to your shower space. Better lighting or windows: Another upgrade with major impact is lighting. This is especially true in the bathroom. Determine how you can brighten and illuminate your current shower space: New overhead lights? Glass tile? A window or skylight? Find ways to make your shower feel brighter, and you make it more appealing for daily use. Whether you’re planning to sell soon or far in the future, upgrading your shower design is a wise investment. To get inspired with ideas for remodeling or building, think about the five ideas above. Whether you swap a curtain for a glass door or add something simple like a new showerhead, you can take your shower to the next level one step at a time. When you’re shopping for the best values in shower additions, browse our website. With Modern Bathroom, you can explore various shower products, offered at factory-direct prices with free shipping you’ll love. The Hands-Free Faucet. Sustainable home design is not only good for energy savings, but it’s good for energy costs. 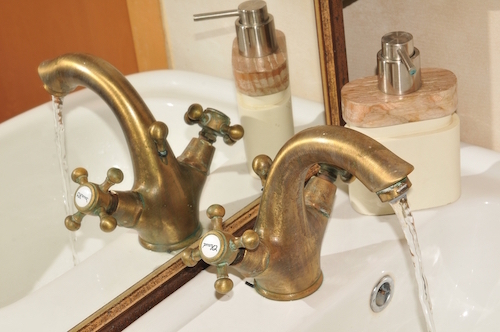 Any time you can cut water consumption, you cut water bills — and that’s why water-saving faucets are on trend. In keeping with the water-saving bathroom features growing in popularity today, the hands-free faucet is made to cut water consumption with a low-flow aerator. This motion-activated touchless faucet also has a sensor that makes false activations difficult. Bronze and Oil-Rubbed Finishes. Goodbye, polished nickel, and hello, bronze! Both bronze and oil-rubbed bronze finishes are becoming increasingly popular, in bathrooms and kitchens. Because the market is filled with faucet finishes, there are lots of choices to fit your bathroom design and personal tastes, but to be on trend, look into bronze finishes. Customized Finishes. In the world of modern bathroom designs, you’ll find everything from beautiful brass to textured faucet finishes. With so many options, there’s really something for everybody — but, to be truly on trend, consider customizing the faucet to your tastes. By custom-ordering your faucet, you can create a finish that not only appeals to your design sensibilities, but also that uniquely fits your overall home style. Natural Shapes and Patterns. Designed to highlight nature’s beauty, another current faucet trend is faucets shaped like water arcs or birds, or other objects found in nature. By mimicking shapes and patterns found in nature, these faucets may convey a sense of tranquility in your bathroom. Contemporary Styles. Because the bathroom has become a place to make a bold statement in home design, an increasing number of homeowners are going with contemporary styles with their faucets and other features. Another popular choice is to mix and match contemporary and traditional features to create a unique look. Whether you’re building a new home and picking faucets for the bathrooms, or remodeling an existing bathroom at the place where you now live, when you’re looking for quality bathroom faucets, come to Modern Bathroom! We understand the ins and outs of master bathroom trends and guest bathroom trends, and our large catalog of faucets and other fixtures provides everything you need to create a beautiful space. Contact us today to learn more!